Coaching inns opened in Church St and King St to serve travellers. The 1635 map of Twickenham by Moses Glover shows �The Coole Brewery' on the London Road, on land now occupied by the railway station north of Regal House. This brewery, the earliest yet noted in Twickenham, later moved across the road where it remained in the possession of the Cole family until the late 19th century, when it was sold to Brandon (Putney) Brewery. Brewing continued until 1927. In the 19th century there were two other breweries in the parish, one in London Road just to the north of York Street and another, the Britannia, behind the former Red Lion in Heath Road. The Cole Brewery came to own many public houses: 18 in 1790, 29 in 1800, 42 in 1822 and 55 in 1824. Public houses have a long tradition of operating from the same site. The Queen's Head, now known as the Barmy Arms, was probably serving the community in the 17th century. Nearby, at the foot of Wharf Lane stood The Watermen's Arms, visible on Peter Tillemans' view of Twickenham in about 1725. 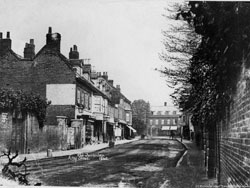 Three inns are recorded in Church Street. 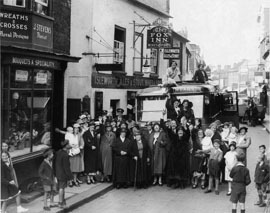 The Fox was operating as 'Le Bell' as early as 1700, changing its name in the mid 18th century. As you enter the recently refurbished premises the steps down remind you that Church Street has risen more than a foot since The Fox was built. Nearby stood The Falcon (nos 44-50 today), noted in 1696 and known variously as The Old Falcon, Three Tuns and The Lyon and Lamb. The Fleece stood on the land now occupied by 24-27 on the north side of the street. Another Fox is recorded in Cross Deep in the 18th century, probably taking its name from Fox Lane, now Grotto Road. The picturesque White Swan on Riverside, previously known just as The Swan, has been there since at least 1714. The Black Dog in London Road is first recorded in 1722. In recent years it has had a series of name changes and is now The Grand Union, though closed at present. During the 18th century two inns catered for the coach trade through King Street. The George from 1709 and The King�s Head (previously The Feathers) from 1726. They were the two largest public houses in the parish in 1818; each with extensive yards for stabling covering nearly a third of an acre. They were staging posts; The King�s Head, on the south side of the street served coaches from London while The George, nearly opposite, served those going towards London. The George, with its yard converted to a patio, is still there but the old King�s Head was demolished in 1926 when King Street was widened. A replacement built in the garden behind the old building was later renamed The Bird�s Nest. It closed in 1970 and shops now occupy the site. The Crown at 174 Richmond Road is mentioned in 1730. 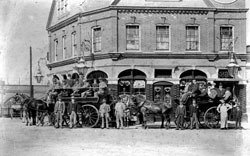 Other inns with their origins in the 18th century, included The Red Lion (recently converted to house a Tesco�s store) and The Three Kings in Heath Road. Another was the Royal Oak (now The Tup) at 13 Richmond Road at the corner with Oak Lane which is mentioned in 1723. The Eel Pie Island Hotel burnt down in 1971 during demolition but there had been an inn on the site since at least 1729 and quite possibly a lot longer than that. It was initially called The Ship, and later The White Cross on the Ayte. 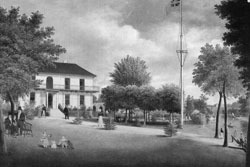 The old premises were replaced in 1830 and became a popular Victorian resort capable of accommodating parties up to two hundred people. In the 1960s it became a club for popular and jazz music and many groups including the Rolling Stones and Black Sabbath played there. Houses now occupy the site. The Beer House Act permitted any householder to sell beer and cider after obtaining a license from the Commissioners of Excise and so many beer houses opened, some eventually being fully fledged public houses. Among the first of these were The Rifleman in Fourth Cross Road, The Turk�s Head in Winchester Road (mentioned as a beer house in 1855 and rebuilt in 1902) and The Five Oaks at 209 Staines Road (a beer house in 1837, licensed by c1880 and now called The Bloomsbury). Another in Staines Road, at No 15 near the Prince Blucher, was The Sussex Arms (originally an 1837 beer house). 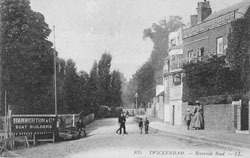 As Twickenham expanded along the main roads new public houses were opened: The Rising Sun in Richmond Road (by 1841), The Prince of Wales along Hampton Road (c 1850) and Pope�s Grotto Hotel in Cross Deep (1853) which was bombed in 1944 and then rebuilt. It has twice been extended and refurbished in recent years and renamed The Alexander Pope. The coming of the railways led to an increase in the number of pubs. 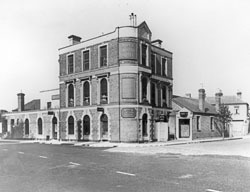 In Twickenham three �railway� pubs opened; The Albany Hotel (1860s), The Railway Hotel (opened 1853, closed in 1962 and demolished) and The Railway Tavern (opened 1853 and now called The Cabbage Patch). By 1900 the number of public houses had risen to 35 with 30 beer houses. In the 20th century The Fountain was built in 1939 in Staines Road. This, with its large car park can be described as a Road House: the modern equivalent of an old coaching inn.